NY Governor Andrew M. Cuomo. Photo by: Governor's Press Office, via Flickr. Long Island, NY - March 26, 2019 - Governor Andrew M. Cuomo was joined today by the full delegation of Long Island Senators for a rally at Clinton G. Martin Park in New Hyde Park in support of the Governor's campaign to make the 2% property tax cap permanent. Earlier this month, the Governor vowed that he will not sign a budget without the permanent property tax included while outlining his remaining budget priorities. "Washington's tax plan took care of the rich, but cast the burden on states like New York and did nothing for the middle class," Governor Cuomo said. "In this budget we are taking action so we can say to the middle class, we hear you, we know your pain, we know you're struggling, and this hand will not sign a budget that does not have a permanent tax cap, period." In 2011, Governor Cuomo vowed to bring property taxes under control once and for all. After years of trying to cap property taxes, New York passed the first ever 2% property tax cap. Since the implementation of the tax cap in 2012, local property tax growth has averaged 1.9%, compared to 5.3% average growth from 2000 to 2010, and the tax cap has produced approximately $8.7 billion in taxpayer savings on Long Island and $24.4 billion statewide. The property tax cap has changed long-term trends and the trajectory of the state. Last month, Governor Cuomo launched a Tax Fairness for the Middle Class Campaign in support of middle class tax relief. To illustrate the benefits of a permanent property tax cap, Governor Cuomo unveiled a digital tax calculator to showcase estimates of how much taxpayers have saved under the property tax cap and will continue to save over the next 10 years with a permanent property tax cap. As part of the campaign, the Governor also remains committed to the phase-in of his historic middle class tax cuts. Under these reforms, middle class tax rates will drop to 5.5 percent and 6 percent, depending on income, when the cuts are fully phased in - an up to 20 percent cut in income tax rates for the middle class - and produce a projected $4.2 billion in annual savings for six million filers by 2025. As the new rates phase in, they will be the State's lowest middle-class tax rates in more than 70 years. Senator John Brooks said, "The Property Tax Cap has proven itself a vital tool in controlling residential property taxes over the last several years and I fully support efforts to make it permanent. This legislation will extend the effectiveness of the Cap while providing the necessary relief and continued stability for Long Island." Senator Todd Kaminsky said, "Long Islanders demand tax relief and a permanent tax cap is the best way to address affordability on Long Island. It is essential that a permanent tax cap be included in this year's budget." Senator Anna M. Kaplan said, "With the federal administration declaring war on New York taxpayers by reducing the State and Local Tax (SALT) deduction, it's becoming harder and harder for Long Island families to make ends meet. Governor Cuomo's 2% tax cap has worked to slow the growth of property taxes on Long Island and help government to live within its means, and that's why I'm standing with Governor Cuomo and my Long Island Senate Majority colleagues to fight to make it permanent in the state budget." Senator Monica Martinez said, "The residents of the Third Senatorial District entrusted me to serve as their New York State representative and, with that, I am committed to being fiscally responsible by protecting the hard-working taxpayers of my district. As a former teacher and administrator, I also keenly understand that Suffolk County's school districts are facing an ever-increasing need to invest in the needs of their students. I look forward to working with Governor Cuomo, my colleagues in the Legislature, school district representatives, and community stakeholders to ensure that we protect New York taxpayers while enabling schools to continue to provide a quality education." Senator Kevin Thomas said, "Our residents on Long Island must have a permanent property tax cut. 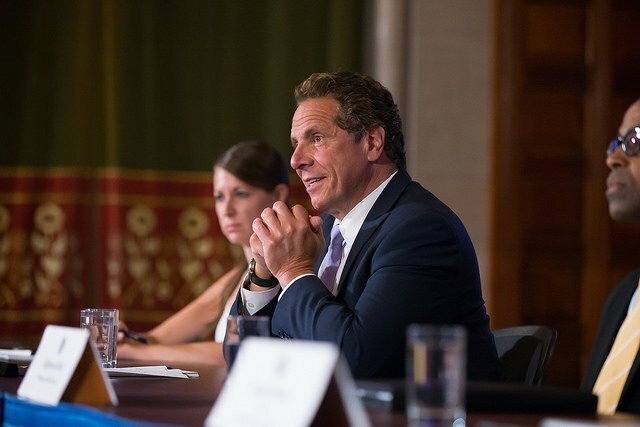 Governor Cuomo is right to stay strong on this pivotal issue for millions of New Yorkers. This needs to be a priority for my colleagues in the Senate and the Assembly. There should not be a budget without this critical component to help homeowners." Nassau County Executive Laura Curran said, "I commend Governor Cuomo for his ongoing commitment to Long Island families. I am working hard to hold the line on taxes in Nassau with a 2019 budget that did not contain any property tax increase. A permanent property tax cap will continue to help save our residents money and ease their burden for years to come." Suffolk County Executive Steve Bellone said, "No matter if it's Albany or Amityville, Governor Cuomo's property tax cap has saved thousands of dollars for suburban homeowners across the state. Now more than ever, we need to make the property tax cap permanent to protect homeowners - no questions asked." Subject: LongIsland.com - Your Name sent you Article details of "Governor Cuomo And Long Island Senators: No Tax Cap - No Deal"